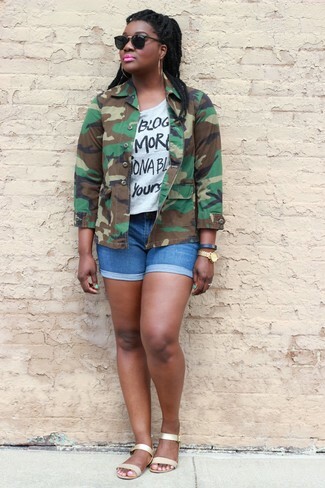 We're all outfiting for comfort when it comes to dressing up, and this combination of an olive camouflage military jacket and blue denim shorts is a vivid example of that. Choose a pair of gold leather gladiator sandals to have some fun with things. 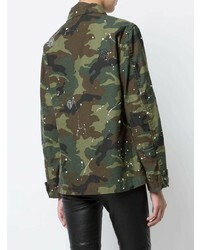 Try teaming an Amiri military jacket from farfetch.com with black skinny jeans for a lazy day look. When it comes to footwear, this look is finished off wonderfully with tan suede lace-up flat boots. If you're obsessed with practicality dressing when it comes to your personal style, you'll love this adorable pairing of an Amiri military jacket and black skinny jeans. Throw in a pair of grey athletic shoes to make the look more current. 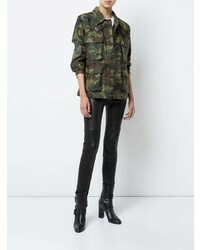 If you're all about relaxed dressing when it comes to fashion, you'll love this seriously chic pairing of an Amiri military jacket and black skinny jeans. Rocking a pair of brown suede ankle boots is a simple way to add some flair to your getup. If you're all about feeling relaxed when it comes to dressing up, this combination of an Amiri military jacket and a white and black horizontal striped casual dress is right what you need. Kick up the cool of your ensemble by rounding it off with beige suede heeled sandals. 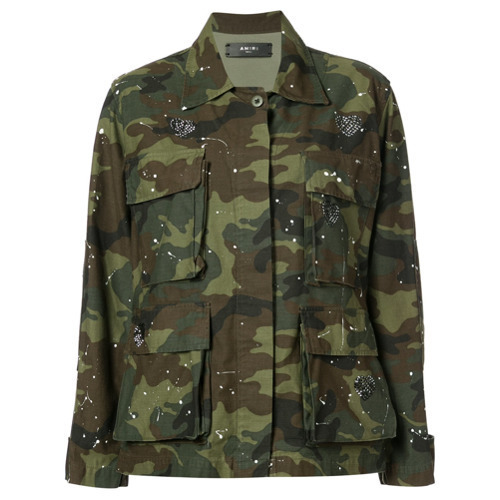 If you're a fan of relaxed dressing when it comes to your personal style, you'll love this seriously stylish pairing of an Amiri military jacket and blue denim shorts. Dress down this getup with gold leather flat sandals. 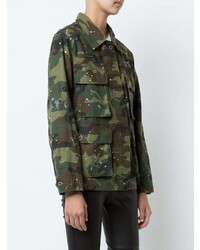 If you're obsessed with relaxed dressing when it comes to your personal style, you'll love this seriously chic combination of an Amiri military jacket from farfetch.com and a black leather mini skirt. When it comes to footwear, this getup is complemented wonderfully with white low top sneakers. If you're obsessed with relaxed dressing when it comes to your personal style, you'll love this absolutely chic pairing of an Amiri military jacket and black leather shorts. Throw in a pair of black leather ankle boots to instantly up the chic factor of any outfit. If you're obsessed with comfort dressing when it comes to your personal style, you'll love this super cute combination of an Amiri military jacket and black denim shorts. Kick up the cool of your getup by completing it with tan cutout leather ankle boots.